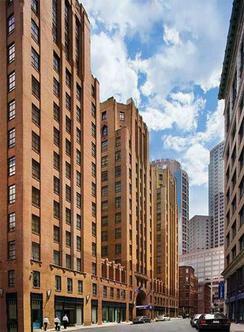 Four-Diamond Service in a Historic SettingBuilt in 1928 as Boston, Massachusetts' first skyscraper, the historic Hilton Boston Financial District hotel is the ideal blend of old and new. Our stylish renovation brought new luster to our 1920's intimate art deco decor of warm brick, rich woods and brass and added a host of modern comforts and conveniences. The hotel's ongoing commitment to superior boutique service and exceptional standards of excellence earned us the coveted AAA Four Diamond Award for the past seven years. At the Hilton Boston Financial District hotel our guests can relax in a spacious guestroom with an enchanting view of the city and enjoy period-style furnishings and thoughtful business amenities like cordless, two-line phones and wireless high-speed Internet access. Savor an eclectic blend of California and Tuscan cuisine at Caliterra Bar & Grille, relax with a book in the library or unwind in our state-of-the-art fitness facility featuring Precor equipment with individual 12'' screen televisions. At the Hilton Boston Financial District hotel, our team is committed to make your stay a memorable one. LocationThe Hilton Boston Financial District hotel is perfectly situated in the heart of downtown Boston, Massachusetts in the Financial District, one block from Boston's Waterfront, ten minutes from Logan International Airport and 1.1 miles from the Boston Convention & Exhibition Center (BCEC). Nearby attractions include Post Office Square, Quincy Market, Faneuil Hall, Downtown Crossing, the Freedom Trail, New England Aquarium, Children's Museum and the TD Banknorth Garden.Rooms & AmenitiesThe spacious guest rooms and two-room suites, each with high ceilings and crown molding, make the Hilton Boston Financial District hotel stand above the other area hotels. Features include such welcome amenities as wireless Internet access, two-line telephones, mini bars, lush bathrobes and 24-hour room service just to name a few.Meeting & Banquet FacilitiesWith over 10,000 square feet of flexible meeting and banquet space the historic Hilton Boston Financial District hotel makes for the perfect location to host your next business or social gathering. The 1,893 square foot Kellogg Ballroom accommodates up to 150 reception guests and divides into three sections. Three well appointed executive boardrooms are available for your next board meeting and 14 additional meeting rooms are ideal for any type of event.DiningMeet colleagues in Caliterra's lounge for a casual setting featuring an array of specialty martinis, wines and light fare bar menu, dine in Caliterra Bar & Grille, our signature restaurant offering a wide variety of culinary California and Tuscan cuisine for breakfast, lunch and dinner or enjoy the comfort of our full room service menu. The Hilton Boston Financial District Hotel Features: Gift shop catering to all business and personal needs, Express self check-in kiosk for hotel arrival and airline departures, Experienced full service concierge staff, Wired and wireless Internet access, in all guest rooms, meeting space and public areas, 24-hour executive business center, offering computer, fax, email and copy services, Complimentary beverage services in the lobby available daily in the morning and evening, A Professional sales and catering team to assist with all your group needs, Hilton HHonors, frequent guest reward program.Travel should take you places.